Epic about the effect of the Vietnam War on a Pennsylvania steel town following several stories, including an embittered POW (De Niro) an abandoned wife (Streep), and an maimed vet (Savage). Michael Cimino (who also won the Oscar for direction). With John Cazole, John Savage, George Dzundza, and Chuck Aspegren. Michael Cimino (1940 - ) American director, screenwriter, and producer who has written most of his own scripts. 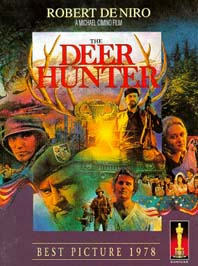 He is probably best known for his biggest hit: THE DEER HUNTER and his biggest flop: HEAVEN'S GATE. Richard Portman, William McCaughey, Aaron Rochin, and Darrin Knight shared the Oscar for Sound; while Peter Zinner received the Editing Oscar.